As communities worldwide are becoming more active and vocal with their fight for zero-waste, Portuguese Airline Hi Fly surprised its passengers traveling from Lisbon to Brazil with a welcome change to its in-flight meal service — all of its single-use cutlery and meal containers have been replaced with recyclable and compostable materials. 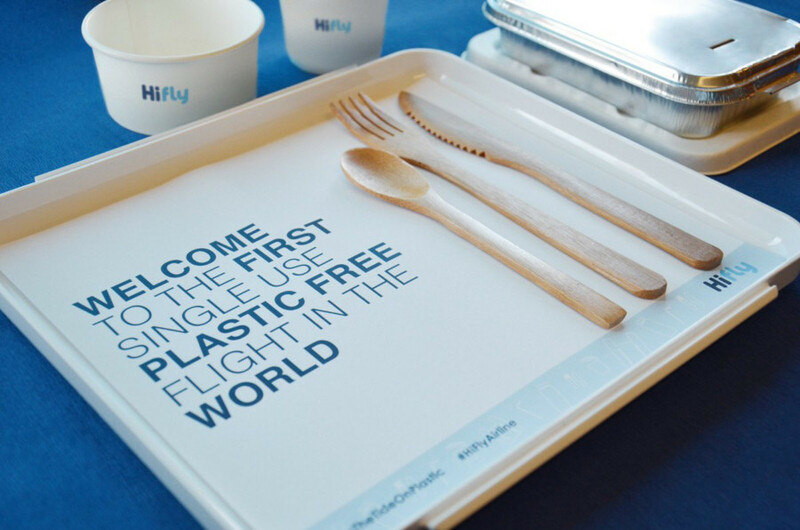 This officially marked Hi Fly as the first airline in history to conduct a plastic-free flight. The flight which took off on December 26, 2018 had been a test run for the company whose goal is to completely ban the use of single-use plastic from all of their flights by the end of 2019. Among all the plastic and single-use items Hi Fly replaced included cutlery, cups, salt and pepper shakers, food containers, individual butter pots, and soft drink bottles. They also replaced the plastics from beddings, barf bags, and toothbrushes. Mirpuri also states that an estimated amount of 350 kg of disposable plastics would be saved from being used by conducting these test flights. It’s definitely a significant baby step, considering the harrowing information shared by the International Air Transport Association (IATA), who discovered that over 5.7 million tons of cabin waste was generated by airline passengers in 2017 and can easily be doubled within fifteen years if no action was taken. Hi Fly plans on conducting a few more tests making use of more items made of plant-based, renewable, low-carbon, and recycled materials. Meanwhile, other airlines are also taking steps to achieve plastic-free flights within five years. Air New Zealand had previously announced that it has removed straws, coffee stirrers, toothbrushes, and plastic packaging off its lounges and aircrafts, and is eying to ban more in the coming year. Alaska Airlines and Delta have also begun scrapping its use of plastic straws. Locally, Cebu Pacific had also declared that it will start using bio-compostable utensils, biodegradable paper cups, and compostable wooden stirrers on all its flights starting October. What do you think about this news? Share your thoughts in the comments section below!